July 30, 2012 By arzea 1 Comment This post may contain affiliate links. Read my disclosure policy. 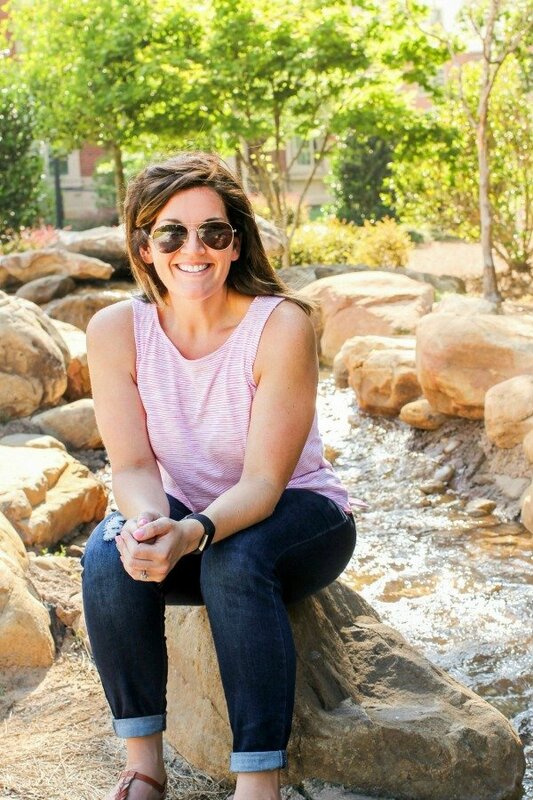 Today we have guest blogger, Nicole all the way from Las Vegas! 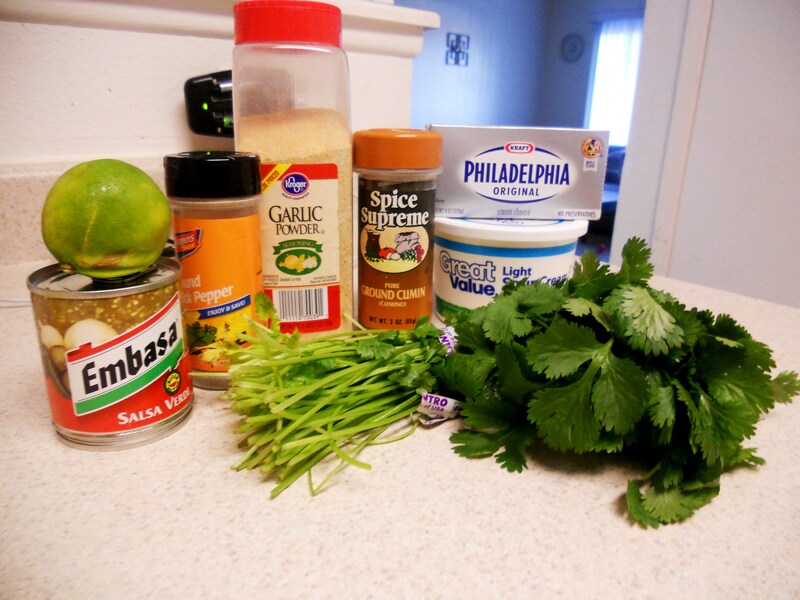 She cooked up delicious Southwestern Egg Rolls with a to die for Cilantro Sauce (YUM!). These rolls remind me of the ones people always order at Chili’s and other ‘Mexican’ restaurants, but now you can make them at home! I would love to try these without the chicken and with extra beans instead. I think they would be delicious!! 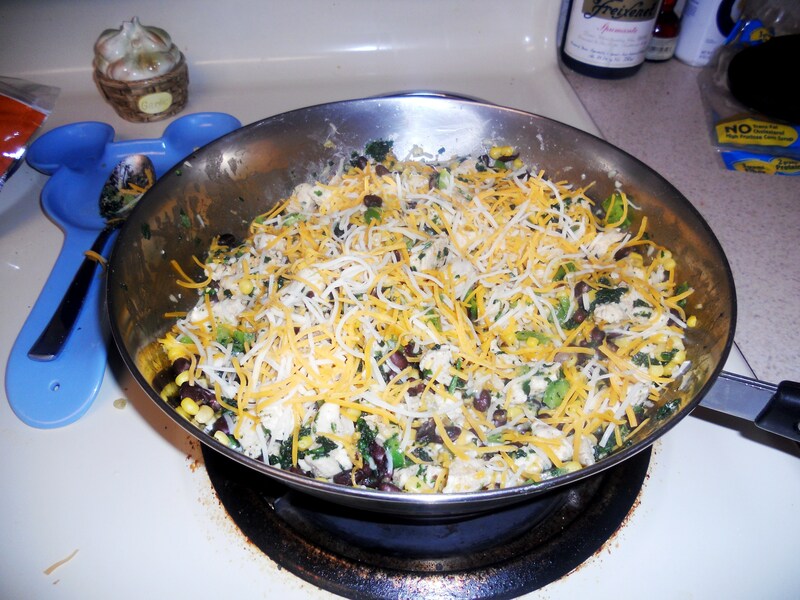 A big thank you to Nicole for this awesome recipe and blog post!! Here we go! Whenever I have a potluck to attend or plan on having guests over I want to make a delicious comfort food that I know they’ll love. 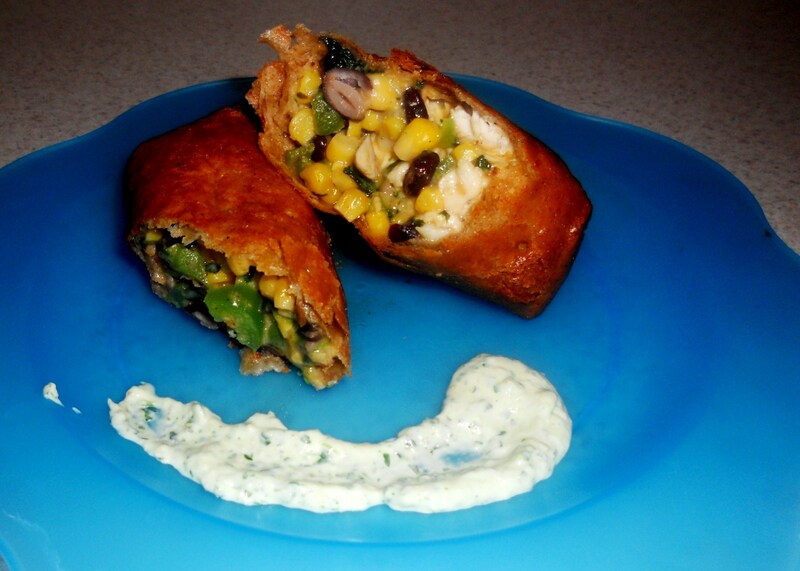 The one recipe that I make often (not often enough my husband says) is my southwestern egg rolls. They are simple, easy and affordable. In a nutshell they’re mini fried burritos. Who doesnt love good fried mexican food?! Its best to do this recipe early in the morning because they will need to be frozen for four hours before cooking. This recipe makes enough for 4 people, 10 servings. OR since you freeze them you can make tons and then only cook half and save the other half for another night. 10-12 (6 inch) flour tortillas. I like to use the whole wheat. 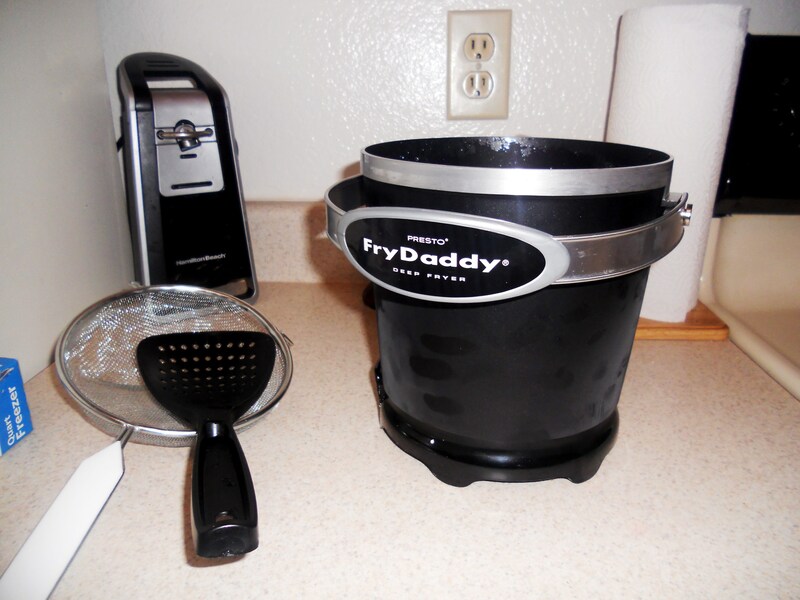 Lastly, A deep fryer (with oil) or if you want a healthier alternative you can bake them but they will not be as crunchie and golden. To begin, dice both chicken breasts into small bite sized pieces. 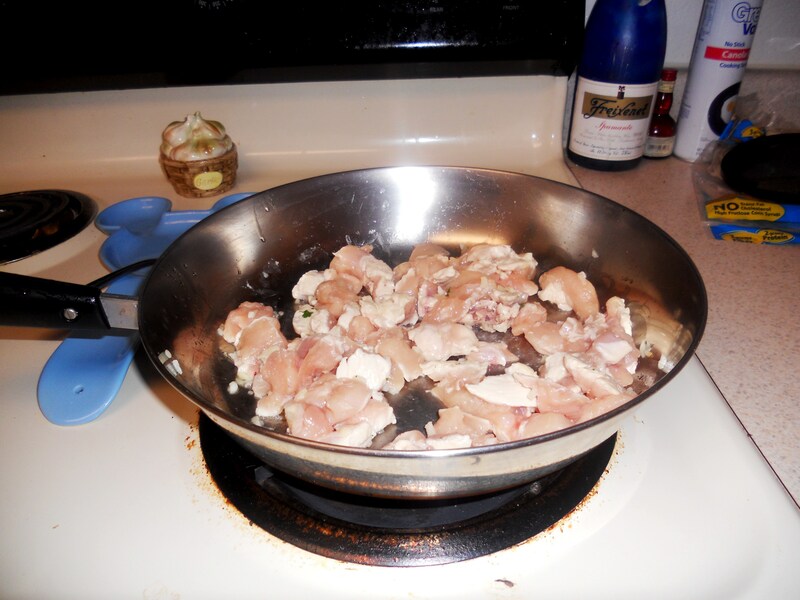 Pour the EVOO and garlic clove into a large pan, let it warm then add the diced chicken. Cook until no longer pink, on medium heat about 10 minutes. 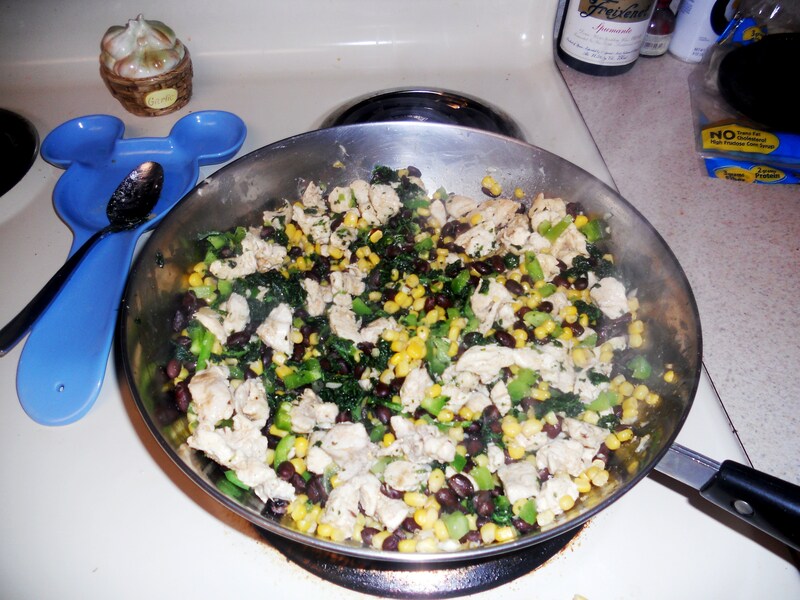 In this time you’ll be chopping and dicing the bell pepper, jalapenos and using your can opener to open the cans of corn and black beans. 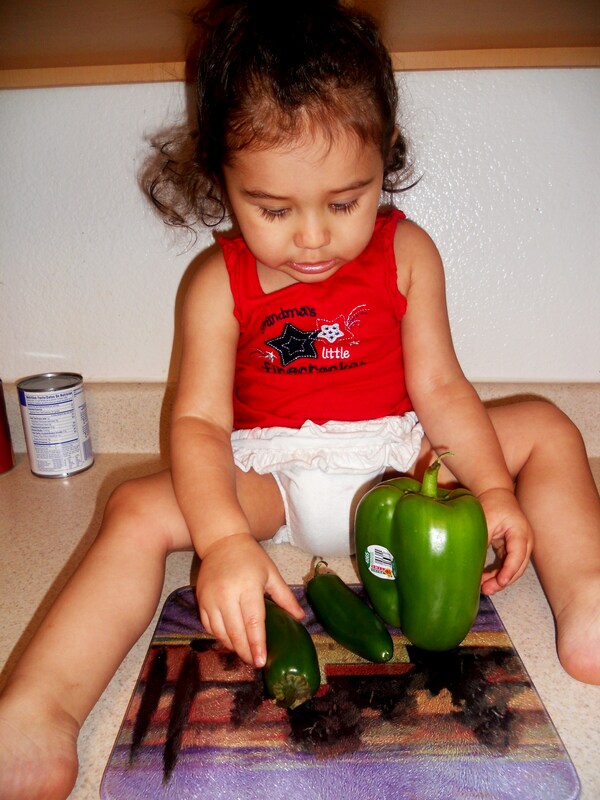 Someone has a little helper! 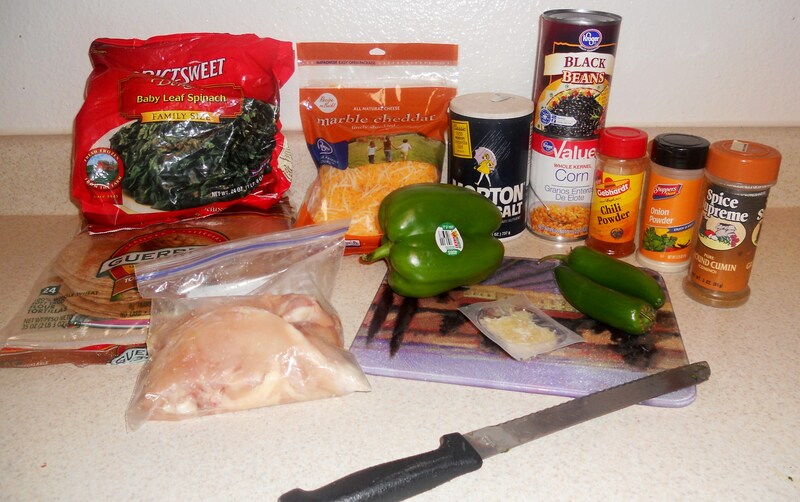 Once chicken is cooked, add ALL ingredients EXCEPT the cheese into pan at once, including all spices. Let it cook until aroma fills the air and makes you want to eat it right then and there! About 5 minutes. Next, you’ll turn off the heat and add the cheese. Mix well. Wrap tortillas with a clean, lightly moist cloth. Microwave on high approximately 1 minute, or until hot. You’ll want them soft enough so they fold easily and do not break. 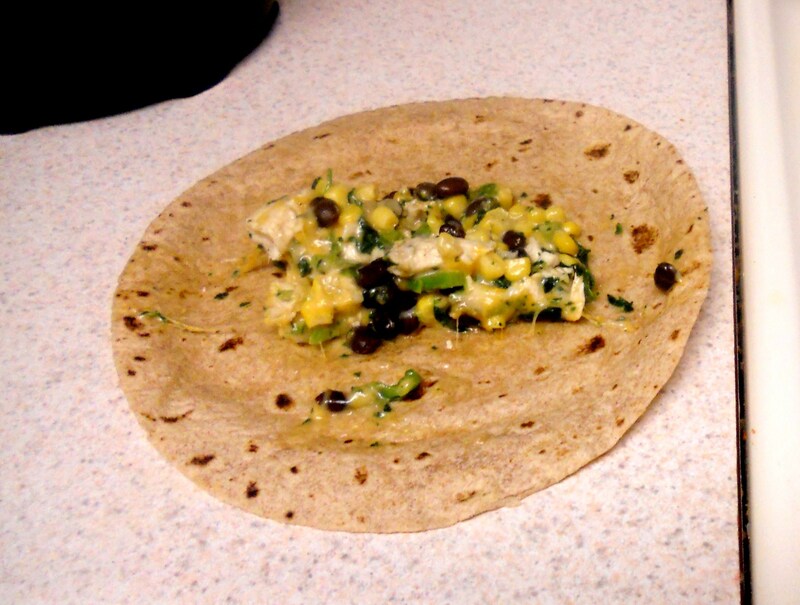 Spoon amounts of the mixture into each tortilla. 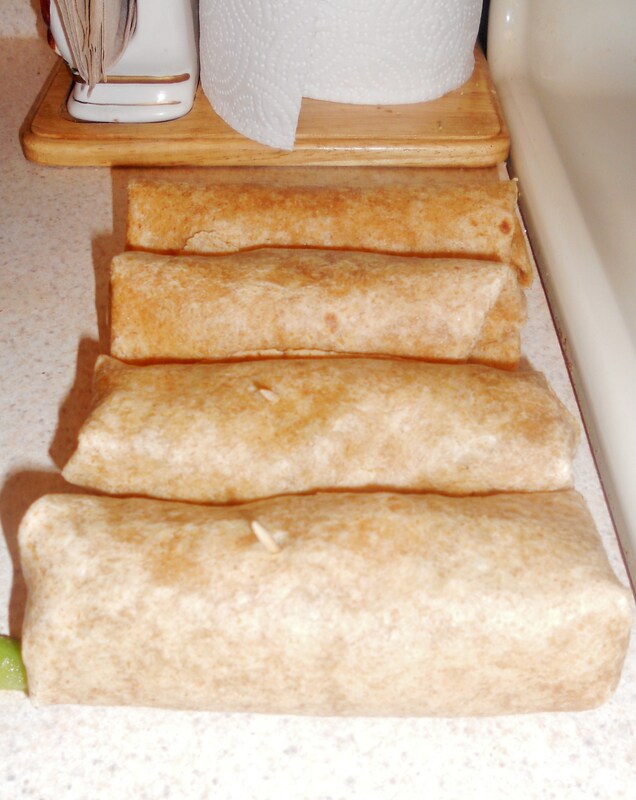 Fold both ends of tortillas, then roll tightly. The tighter the better. Secure with toothpicks so they dont unroll, because that would be annoying! Arrange in a dish, or like I do, I put them in a zip block bag, and place in the freezer. Freeze at least 4 hours. You’ll want them hard so they go easily into the fryer or oven and cook evenly. In a large, deep skillet, (or like i use, a deep fryer) heat oil for deep frying to 375 degrees. 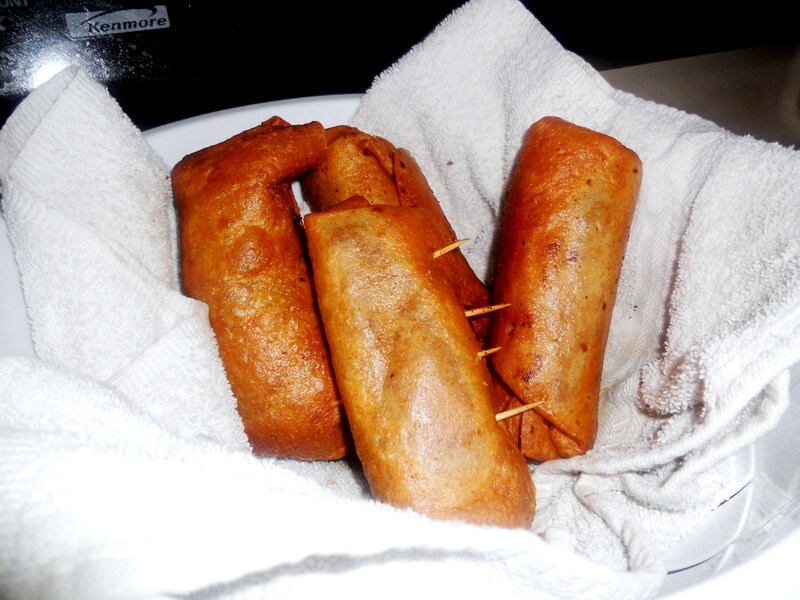 Deep fry frozen, stuffed tortillas 5-10 minutes each, or until dark golden brown. Drain on paper towels otherwise they are greasy. If you want to bake them, set your oven to 450 degrees and leave them in for 10 minutes or until golden (perhaps giving a quick spray of pan spray to the outside, to help them crisp up). These can be served with sour cream, but I will say that the best dip for these are Amy’s cilantro cream sauce. Blend 8oz cream cheese, 1 TBSP sour cream, 1 can tomatillo salsa, 1 TSP ground pepper, 2 TSP garlic powder, 1/2 TSP cumin, 1 bunch cilantro & 1 TBSP lime juice. Nicole Garnica lives in Las Vegas NV, originally from San Gabriel, CA. 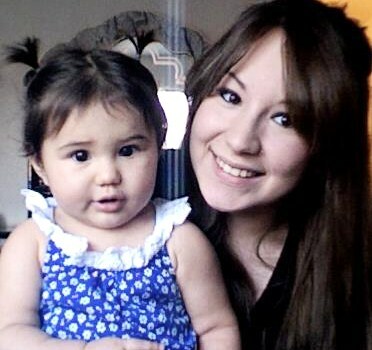 Currently a Stay at Home Mom to 19 month old, Leilah Brooklynn. « So You Want to Shop at Costco? Here is What You Should Buy!